« CAMPAIGN AGAINST URANIUM MINING STEAMS ON! The environment movement has suffered a heavy blow with news of the death of Dr Colin Hunt on 27 December 2013. Colin was instrumental in setting up the Far North Greens branch in 1992 and was the convenor until his departure for Canberra in 1995 when I took over the role. 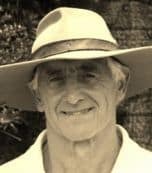 Later he returned to the Far North with his wife Maxine and settled in Yungaburra where he became involved again in local environmental issues giving freely of his time and wide-ranging knowledge for the benefit of others. Colin was a writer, campaigner, teacher and research academic with a special interest in climate change and the protection of the Great Barrier Reef. In particular, he co-authored the first 25-year strategic plan for the Great Barrier Reef World Heritage Area which was adopted by both the Australian and Queensland governments. Colin was a great friend and mentor with a generosity of spirit, ready smile and strong, ethical convictions. He was one of the first ecological economists in Australia when that very term seemed a contradiction. How could a practitioner of the ‘Dismal Science’ be ecologically oriented? Although still not mainstream enough, the field is now well established, particularly under Professor Ian Low’s guidance, at Griffiths University. Consumer capitalism is built upon the denial of environmental constraints and Colin had the rare skill, derived from his core training in agricultural science and economics, to bridge the economics/environmental divide. In traditional economics the ecological imperative is simply written out of the money equation. Colin argued cogently and regularly in his website and published articles for proper accounting practices that factor in all of the externalities – such as pollution, climate change and forest clearing – that threaten our planet but are not counted as costs in Gross Domestic Product statistics. Our thoughts go out to Maxine and his children and grandchildren at their great loss.